Monterey Bay Moves’ First Bootcamp Was a HIT! 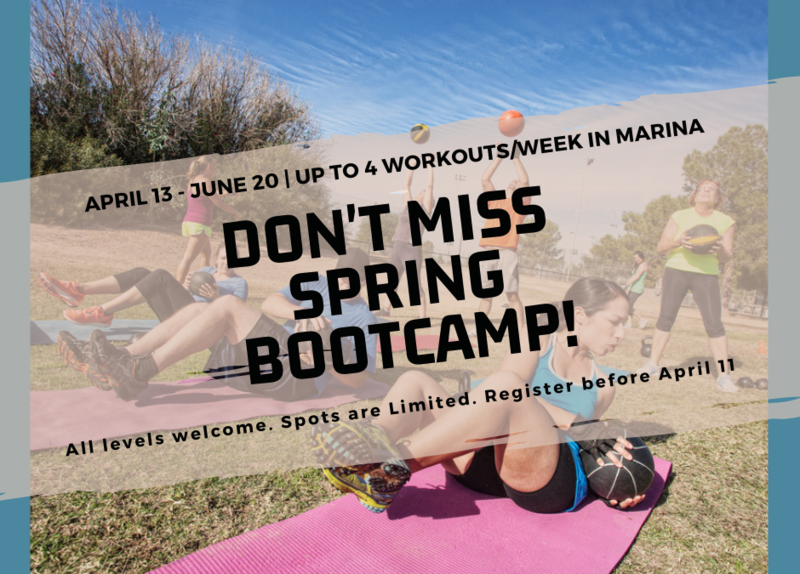 Monterey Bay Moves, Marina’s new personal training and group training fitness business, is happy to announce that March Madness Bootcamp is a success! Registrations for the 10-week bootcamp semester have already started. Bootcamp sessions start on April 13 and end June 20. Monterey Bay Moves’ Bootcamp allows participants to attend 2 to 4 weekly small group workouts. Expect intensity with Bootcamp-style workouts, Core & Balance, High Intensity Interval Training (HIIT), Pilates-style Training, Strength Conditioning and Cardio, of course! 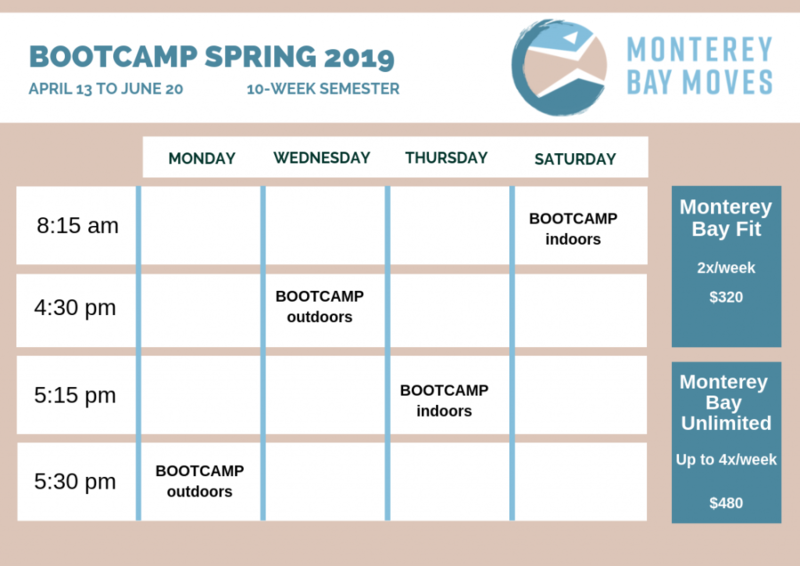 Because health and fitness is about so much more than doing push ups, running sprints and dieting, Monterey Bay Moves’ bootcamps feature mindfulness coaching sessions to help make the changes in participants’ lifestyle stick. Among other things, mindfulness coach Oscar Flores explains how to not rely solely on external factors for shifts in eating and fitness habits, but on internal indicators, such as being aware of negative and unhelpful thoughts around and during the times that people exercise and eat. – Wednesday 4:30pm at Locke-Paddon Park (meet at Marina Library Parking Lot) NEW TIME SLOT! Monterey Bay Fit or Unlimited? Not only will there be one new time slot for training, but there will be 2 different program options. This Spring, participants have the choice to attend 2 weekly workouts or have unlimited access to the 4 time slots offered. The minimal recommendation of 150 minutes of moderate intensity exercise per week as recommended by the American College of Sports Medicine can be met with the Monterey Bay Unlimited option. The Monterey Bay Fit option is perfect for adults who are already active and want to supplement their lifestyle with fun, intense and social bootcamps. 3-4x/week – Drop in to a few classes a week or come to every single session for maximal work and fun! Participants may bring their own exercise mat or purchase a 6-mm Deluxe Monterey Bay Moves mat for $30. 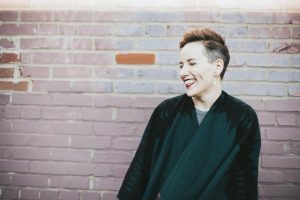 Head Trainer and Owner Elizabeth Plante will be coaching Spring Bootcamp 2019. She is an American College of Sports Medicine Certified Personal Trainer and triathlon enthusiast. Her weight loss transformation and lifestyle overhaul is nothing short of inspirational. Elizabeth’s training style is both tough and cheerful. She educates participants and pushes them you reach their full potential. What she loves most is seeing people realize how much more they’re capable of with proper guidance.